and how do you approach the subject? I've taught a good few people during my time giving driving lessons in Nottingham. They've all had their individual strengths and weaknesses as you would expect. it's no problem for an experienced driving instructor to see what these are and adapt their teaching to suit the needs of the pupil. 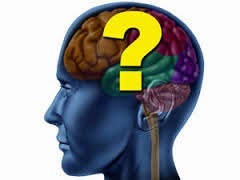 A small number of my pupils have had actual learning difficulties of one sort or another. Hardly any of these pupils had informed me of their condition before starting lessons. I had a pupil once who nearly hit every parked car we drove passed. Upon observing him I noticed he had a glass eye nobody had thought to tell me about. When this was identified it was easy to adapt the teaching and work with the pupil to find a way forward. One pupil seemed to interrupt me every time I spoke. He tried to finish my sentences for me and sometimes just not listen at all. This would seem at first to be a question of bad attitude. I later found out through a friend of his parents that he had autistic spectrum. Why wasn't I informed at first? I don't know. Like many instructors I have signed a code of conduct which ensures that all information remains confidential between instructor and client. Perhaps if the public knew this they would be happy to supply information more readily. I now have a pupil who is very difficult to teach. He will repeat the same simple mistake over and over again even during full talk through. He will make snap decisions that make no sense and put us both in danger. Changing lanes with absolutely no warning at all and no directions from me. At times his behaviour is bordering on childlike. I am convinced that he has some sort of learning difficulty. But how do I bring up the subject? If I ask outright it is bound to cause offence if I am wrong. If I am right he may feel threatened and leave. Past pupils who displayed the same behaviours with repeated mistakes turned out to have some form of dyslexia. Once I knew I could work with them and we both felt more comfortable. 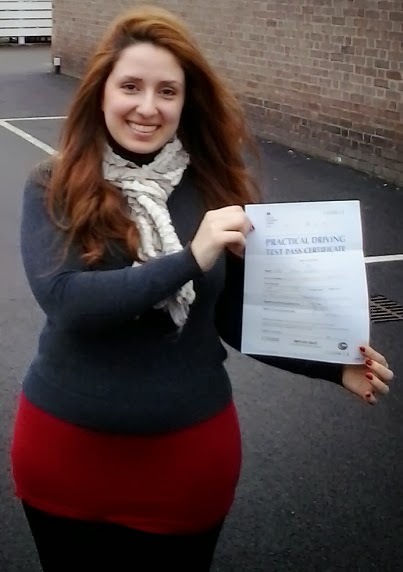 They took more lessons than most people but they passed their tests and became competent drivers. It's a difficult situation with my new pupil. Reckon we'll just carry on and see what develops. It's a happy day for Henry. Well done to the young man pictured here. 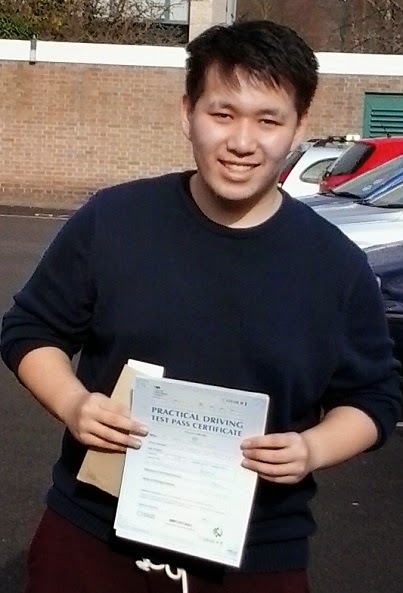 He passed his driving test at Beeston in Nottingham today with a very convincing drive. Only one driving fault was recorded during the test and if Henry hadn't rolled back during a hill start he would have had a perfect pass. He was disappointed at not keeping a clean sheet but none of that matters. He has done it and is now the proud owner of a full driving licence. Henry had a few lessons with me and had previously done a test some time ago. Things were a bit rusty at first but the improvements came quickly to bring things back up to standard. We did a lot of work on manoeuvres. This can be tricky if they have been learned previously with another instructor. 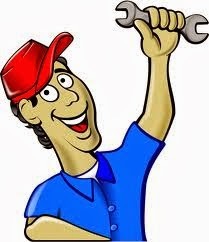 Different methods and a change in the size and model of car can be more confusing than learning them the first time. 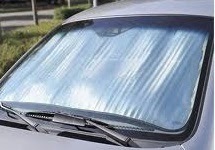 We worked through them and just made some modifications to the original methods so they worked in my car. We reversed around some pretty tight uphill junctions to make sure Henry could handle anything that happened on the test. Following route signs was another area we worked on. In an unfamiliar area with multi-lane roundabouts this can be tricky. You've got to learn to spot the signs early enough so there's time to change lanes. Henry put the work in and is now free to concentrate on his upcoming exams. All the best mate and I wish you every success for the future! Life in the hot seat. I love the summer. Getting out in the garden in my shorts pottering about. Playing with the kids in the park. Clear blue skies and everybody happy. Pity I'm a driving instructor really. I find a long hot summer can be brutal in my line of work. One problem in particular is made worse for me in the hot weather is fatigue. The hot sun pounding through the windscreen hour after hour can really make my eyelids start to droop. If I have a break in the day I always go for the power nap. 20 minutes in a car park with the alarm on my mobile all set really sets me up for the rest of the day. It can be dangerous to let fatigue get the better of you when driving. Before you know it your attention is wondering all over the place. Get some rest and have a break if you can. Petrol is so expensive nowadays and being from the north I'm really tight with money. I like to keep air conditioning to a minimum to save on fuel. I'll use it during the hottest part of the afternoon if I have to. Driver training is usually done at lower speeds so it's more economical to keep the windows open a bit. This can create a problem with road noise when giving instructions. I like the cabin to be quiet when I'm teaching and I find pupils feel less nervous when isolated from the noise of the world around us. Not possible in the summer though. I just raise my voice to be heard above the throng. Keeping the inside of the windscreen clean is essential in the summer. Catch the sun at the right angle and those greasy smears and fingermarks which were more or less invisible before suddenly appear and can really effect vision. I wonder what my pupil thinks of me as well. Perhaps they think I'm scruffy and lazy when the windscreen is dirty so I always get the Mr Muscle glass cleaner on the job. Road markings can be hard to see with the sun reflecting back from the road surface. I hate the noise of the fan coming on all the time. I'd rather be out in the fresh air than in the car. Am I not the most miserable person in the world? 'Keep it dull and overcast' is my motto for the summer. This is the optimum weather condition for teaching people to drive. Besides, why should everyone else be out having fun when I'm stuck in a car? Humbug. Top Class driving instructor in Nottingham. It was a struggle but Tala did it in the end! It's every driving instructor's nightmare. Missing a driving test. Late for a lesson is one thing but missing a test when your pupil is relying on you is quite another. Sometimes it's nobody's fault. The test centre at Beeston has got to be the worst possible location at the moment. Multiple road works on major roads mean that you don't know how traffic is going to be from one day to the next. I picked up Tala at 7.10 in the morning and we set off for a short practice on a roundabout that Tala does not like. With over half an hour to spare on a 10 minute journey we set off for the test. After 15 minutes we had moved approximately 100 metres. I was getting a tight feeling in my chest as I became more certain we weren't going to make it. When we got there I parked the car while Tala ran to the waiting room but to no avail. We were too late. What a nightmare. I dropped Tala off at her university and she got straight on to customer services in order to get another test. I was so surprised when she got a test appointment for 1.30 on that same day. I cancelled a lesson, picked up Tala and we set off to try again. Success! after all the pressure and disappointment she came up with the goods and passed. I honestly don't think I've ever seen anyone look so happy as Tala did at the end of the test. What a day! 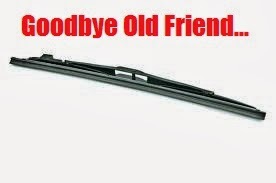 It looks like the end is nigh for the humble windscreen wiper blade. Maybe not such a bad thing anyway. I don't know why but learner drivers seem to have real trouble with the stalk controls. I tell them to push up one click. They put them on full blast. Sometimes they put them on instead of indicating then the back wiper comes on and they're all confused. It can be a bit dangerous when they start looking at the stalk instead of at the road. When it stops raining I see how long I can go watching them squeak across a dry windscreen, giving the pupil every opportunity to turn them off before I intervene but they never do. All this could be a thing of the past thanks to high frequency sound wave technology. It's being developed by McLaren, the motor racing people. It's already being used on fighter aircraft and will repel water, snow and insects. It never fails and is always active. It's the same principle that the dentist uses to remove plaque from your teeth. When it is rolled out the cost of incorporating it into a vehicle at production will be less than the cost of a wiper blade. Let's face it, wiper blades are well expensive nowadays. The question I have is will they actually clean a windscreen like washers and wipers can? it will be good for eco-driving enthusiasts like me who don't like paying for petrol as the car will be lighter because you don't have to have the motors which drive the blades. Might be a bit more aerodynamic as well I suppose. So it's goodbye wiper stalk confusion and hello fighter plane technology. You know it makes sense!